Christians all over the world trust Walk Thru the Bible to help them deepen their spiritual lives through a greater understanding of God's Word. The Walk Thru the Bible small group Bible study series uncovers the richness of the Scriptures. Each guide explores a book of the Bible, a prominent Bible character, or an important biblical theme, offering rich insights and practical life application. These discussion guides are perfect for Bible study groups, Sunday schools, small groups, and individuals who want a deeper understanding of the Bible. Christians all over the world trust Walk Thru the Bible to help them deepen their spiritual lives through a greater understanding of God's Word. The Walk Thru the Bible small group Bible study series uncovers the richness of the Scriptures. Each guide explores a book of the Bible, a prominent Bible character, or an important biblical theme, offering rich insights and practical life application. These discussion guides are perfect for Bible study groups, Sunday schools, small groups, and individuals who want a deeper understanding of the Bible. Walk Thru the Bible has taught more people life-changing truths than any other Bible seminar organization, hosting more than two million participants in its live Bible seminars since 1976. Over their 30-year history more than 100 million devotionals have been packaged into daily magazines, books, and Bibles to provide day-to-day wisdom and offer illuminating biblical insights. Their Global Church Ministries has been a catalyst for discipleship around the world. 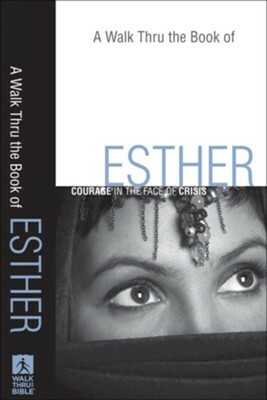 Q: How many lessons are in the Walk Thru the Bible Series - Esther: Courage in the Face of Crisis? There are six sessions within this book. I'm the author/artist and I want to review Walk Thru the Book of Esther, A: Courage in the Face of Crisis - eBook.